Shall We Play A Friendly Game of Chess? Here is a grand competition model based on 1980 play of Vitaly Tseshkovsky versus Alexander Beliavsky. Examining the following action, you will gain a lot of confidence in making promising exchange sacrifices of a rook to eliminate a strong enemy knight or bishop. The entire battle has been annotated, inspired by the action-packed phase from moves 13 to 41. It is full of instructive practical examples. 1 e4 e5 2 Nf3 Nc6 3 Bb5 a6 4 Ba4 Nf6 5 0-0 Be7 Beliavsky is also a renowned expert in the Arkhangelsk Variation, 5 ... b5 6 Bb3 Bb7, but in this game he delays playing ... b5 until the next move, and then its main purpose is to avoid losing a pawn to Bxc6 followed by Nxe5. 6 Re1 b5 7 Bb3 d6 8 c3 Immediately reacting to give the b3-bishop a safe retreat at c2, if required. Of course, White is also preparing to soon make the central advance d2-d4. 8 ... 0-0 9 h3 Another line is 9 d4 Bg4. 9 ... Bb7 10 d4 Re8 11 Nbd2 Bf8 12 Bc2 g6 13 b3 White could have prevented Blacks powerful following move by playing 13 d5, as given in Nunns Chess Openings. 13 ... d5! 14 dxe5 Nxe5 15 Nxe5 Rxe5 16 Nf3 Six years later at Tilburg in 1986, the game Hubner-Beliavsky diverged with 16 f4 Bc5+ 17 Kh2 Rxe4! 18 Nxe4 dxe4 19 Be3 Bxe3 20 Rxe3 Nd5!, and White was forced to give back material because instead 21 Rxe4? would have lost to 21 ... Nxc3 22 Qxd8+ Rxd8 23 Re3 Rd2! on account of the deadly double threats towards c2 and g2. 16 ... Rxe4! Beliavsky makes a very fine intuitive positional exchange sacrifice. Still, he actually regards the late great Tigran Vartanovich Petrosian (1929-84; World Champion 1963-9) as having been the very best of the best in such situations. 17 Bxe4 Nxe4 18 Bb2 Bg7 19 Qc2 19 Rc1? b4 is terrible for White. 19 ... Qf6 20 b4 c5! Black avoids 20 ... Nxc3 because of 21 Re3. 21 bxc5 Nxc5 22 Re2 Rc8 23 Rae1 Ne4 24 Qd3 Qb6 Not 24 ... Nxc3?? 25 Re8+. 25 Nd4 h5! Black gains space while also giving his king a useful loophole at h7. 26 Ba1 White is reduced to making such a passive move, since 26 f3? gets hit by 26 ... Nxc3!, intending 27 Re8+ Kh7! 28 Rxc8 (or 28 Bxc3 Rxc3!) 28 ... Qxd4+ 29 Re3 Bxc8 30 Bxc3 Qxd3 31 Rxd3 Bf5!, when the sting in the tail is 32 Re3? d4. 26 ... Rc4 27 Nc2? Qc7 28 Ne3 Rc5 29 Nd1 Bf6 Not 29 ... Nxc3? because of 30 Re8+ Kh7 31 Nxc3 Bxc3 32 Bxc3 Rxc3 33 Qd4. 30 Bb2 Qc6 Preparing an attack along the a8-h1 diagonal, and indeed this point already proves to be tactically important at the end of the next note. 31 Ba3 Rc4 32 Bb4 Kg7 33 a3 33 Ne3 Nxc3! 34 Nxc4 dxc4 exposes White at g2. 33 ... Qc7! 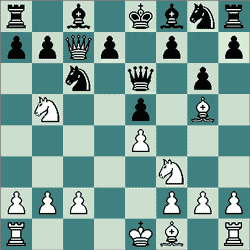 34 Ne3 a5 Showing the purpose of Blacks previous move. 35 Nxd5 Bxd5 36 Qxd5 axb4 37 Rxe4 Rxe4 38 Rxe4 bxc3 39 Qd1 Qc5 Not 39 ... c2 40 Qc1 Bb2? ?, as 41 Qxb2+ is CHECK! 40 Qc1 Bg5 41 Qa1 f6 42 White resigned, helpless against the imminent further advance of Blacks passed c-pawn.